The Israeli parliament has passed a law allowing the force-feeding of prisoners on hunger strike. Under the law, force-feeding an inmate will need to be approved by a judge. Palestinians held in Israeli jails have used hunger strikes to protest against the policy of detention without charge or trial. The Israeli Medical Association condemned the law, saying force-feeding was tantamount to torture, and urged doctors not to participate. The association said it would petition the High Court of Justice against the law, according to Israeli radio. The law passed by a narrow margin of 46 votes to 40. Internal Security Minister Gilad Erden said the measure was necessary as "hunger strikes of terrorists in prison have become a tool to pressure and threaten the state of Israel to release terrorists". Mr Erden's office said the law was initiated following prolonged hunger strikes by prisoners in 2012 in protest at detention without charge. 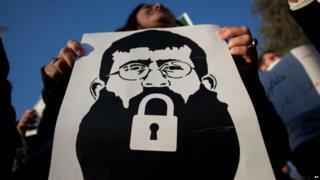 Earlier this month Israel freed Palestinian prisoner Khader Adnan, an Islamic Jihad activist, who was on hunger strike for 56 days. Mr Adnan called the new law "Israeli bankruptcy in dealing with Palestinian prisoners who are on hunger strikes". He had been held for more than a year without charge and his hunger strike had left him in a critical condition.